The Jewel Box quilt block has been around for a very long time. It is a simple four patch featuring only the simplest of patches used in quilting -- the square and half square triangle. 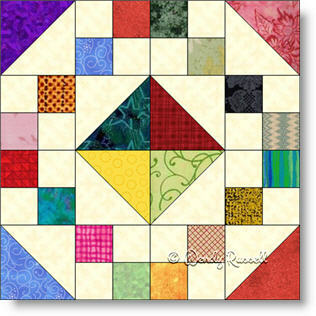 This quilt block is a perfect choice to use up all of those tiny scraps you have been saving. My personal opinion is that quilters used "jewel" coloured fabric scraps and thereby created the name of this block (but I am only guessing). In any case, the more scraps you have the better. The two sample quilts illustrated show you that secondary patterns can emerge as you design the layout of your personal quilt.